Although chefs often pull out caviar and other elegant ingredients during the holidays, the tiny salty fish eggs are showing up more frequently on regular menu items. Here, chef Fuller of Castel Ranch Steakhouse creates petite tacos fashioned from potatoes and topped sparingly with caviar. A little goes a long way. 1. Place potato lengthwise on flat surface and slice at 45-degree angle, making 3 thin slices, like the size of a potato chip. 2. Immerse in boiling water or steamer for 5 seconds to soften and make pliable, then set aside and let cool. 3. In deep fryer, heat vegetable oil to 350 F. Fold up potato slices like a taco shell. With tongs, dip potato tacos in oil and fry until crisp. (Or spray with olive oil and bake in 325 F oven until hard and golden brown.) Set aside. 4. Make a V-cut in remaining portion of potato to make taco-style shell, which allows boat to sit up right on stand. Coat with olive oil and bake for 45 minutes at 400 F or fry in 350 F oil for 5 to 10 minutes until golden brown. Set aside. 5. With immersion blender or whisk, whip cream cheese until soft. Transfer to pastry bag with small round tip. 6. Slice red radish very thin, cut into strips and immerse in ice water. 7. 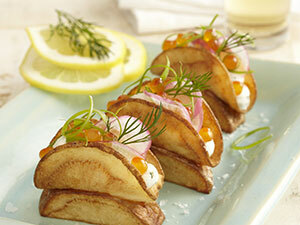 Take taco shell-style potato boat in one hand, hold gently and apply cream cheese into bottom of shell, 3/4 of way up. Add one-third radish strips per shell; top each with 1 teaspoon caviar or salmon roe in center of shell. Garnish with 3 or 4 small sprigs fresh dill. Place in potato bases.